It would be true enough to say that a clean environment is important for human existence, carrying on the daily business tasks and creating wealth out of it. But the complication may arise when it comes to managing a big space such as in schools, gymnasiums, offices or even industries and factories. Having a proper space organization becomes necessary to make it happen. Then. 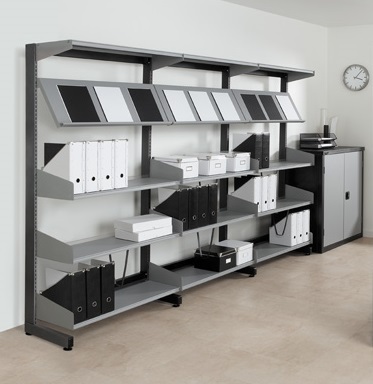 For hassle-free or say smooth working in the space convenient the management needs to come up with some of the best shelving and storage ideas available in the market. For a much understandable explanation, people look for shelving solutions because it helps to maximize the space that is available making the office or home place look much neater and spacious. On the other hand, storage solutions help to keep office or home goods, documents and other possessions together and in a systematic manner. Overlooking the functionality of both, shelving and storage solutions more and more people and business organizations are increasingly favoring for them. Using the workplace space effectively will add to the aesthetic feel of the surroundings. Simultaneously, saving up to the cost by efficiently planning upon the correct type of products becomes necessary. Listed down are some of the solutions that might help you take the correct decision, satisfying your needs and wants. Read to know more. 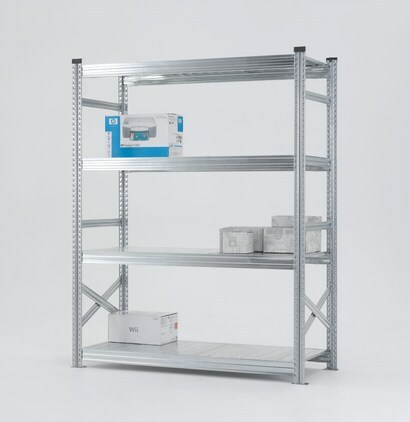 IKON Shelving is flexible, easily adjustable, and in addition affordable at the same time. It is considered an absolute solution for businesses, libraries and, offices. Providing a better space for the storage of loose items, filings, archive boxes and even product samples which generally do not find a good storage place and are left to get covered in dust. This shelving is made of the best quality commercial grade. It is not plastic and not chipboard that will break or bend. It is strong enough to hold heavy weighted items, it is easy to build and adjust, also it has an anti-bacterial finish which reduces bacteria.The other functionality that it offers is its stylish appearance. 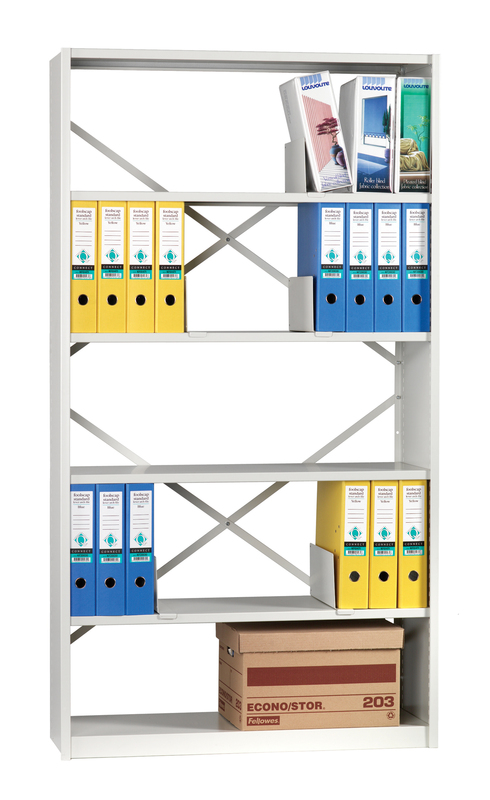 Although it says that it is a library shelving, it can easily be used for companies, offices, publishing houses, schools and so on to store books, publications, magazines, folders, files and box files CDs, DVDs so on and so forth. It’s modular, flexible and adjustable features can ease the usage. The shelving can provide single and double-sided floor standing units. It can be placed as a free standing unit with adjustable feet, or wall mounted or even mobile. The most appealing feature of all is that it has the capability to meet necessary hygiene requirements because of Active coat, as it prevents harmful bacteria and protecting the shelf life of the objects placed on it. As the name suggests, personal effects storage lockers are the most beneficial when it comes to storing personal things when you are at a workplace and do not wish to carry them along the whole time. These lockers are specially designed to keep wallets, purses, keys or even phones. The installation is easy and trouble free as these can be stacked on top of each other by bolting together or can be wall fixed. Talking about the appearance, it can be well complemented with the aesthetic feel of the office. For the ease of functioning, vision panel compartment lockers are available with the option of mobile phone charging and storage space. Splitting the different features, the vision panel available at the locker door helps people to keep a check on the things that are kept in the locker and on the other hand, the mobile phone charging will allow the people to make sure they are least worried about their phone’s battery getting low and at the same time will facilitate them to put away their phone safely, while they are working. A powerful combination is delivered with a clear view giving high visibility from outside and its high strength helps to prevent theft. 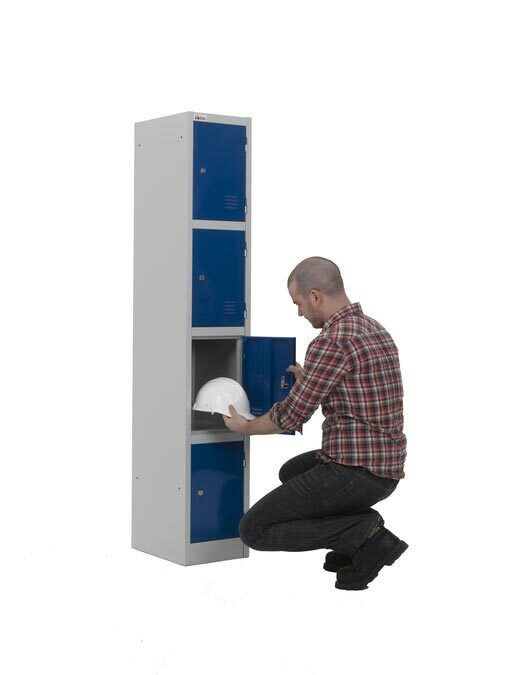 When there is a need to keep some important files and documents safely and away from the reach of the employees, these lockers come in handy. The clear view panel helps to view the entire content at a glance. This feature instantly shuts out the chances of theft or loss as there is nowhere to hide the content and no need arises to open and search through the contents. These lockers can be utilized as standard lockers to store pieces of equipments, files, folders, books, office supplies and so on. There are no exclusive features available other than facilitating space to put standard locks. But, the only benefit that can be opted for is its quick delivery. No pre-ordering is needed, they are despatched straight away and can be delivered in 3-5 days. 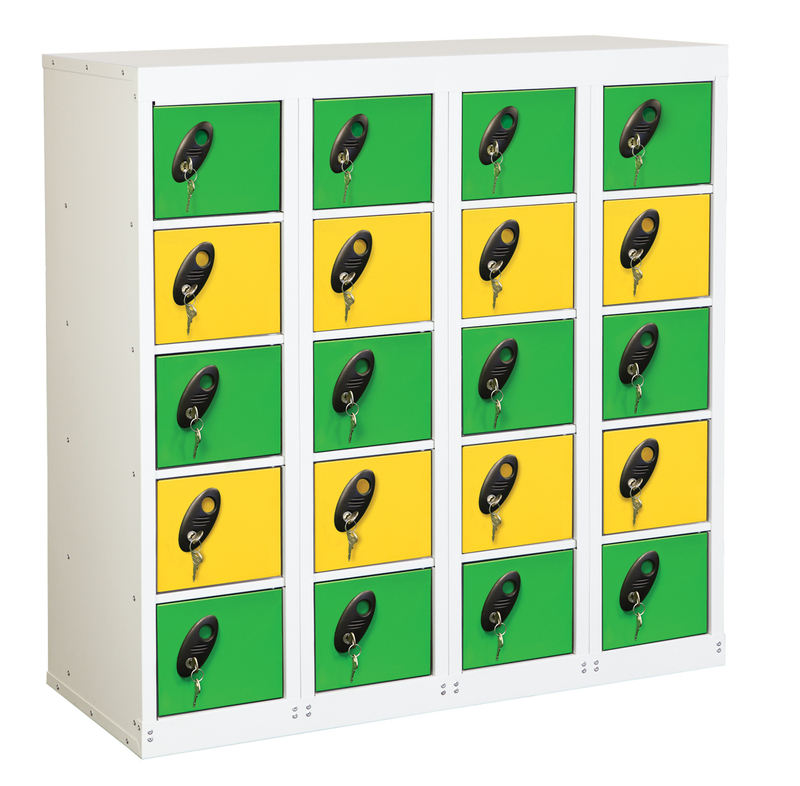 If the office management is looking for a much pocket-friendly, compact yet fully featured options for setting up the lockers, then Cube and Quarto Lockers are a good storage investment. 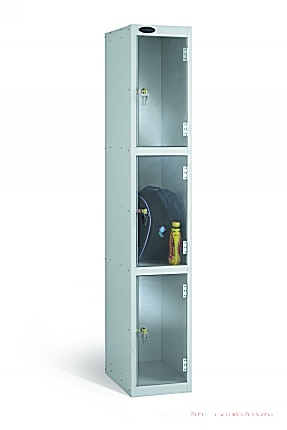 Both Cube and Quarto Lockers are made from strong steel to keep safe equipment, clothing and, personal belongings. 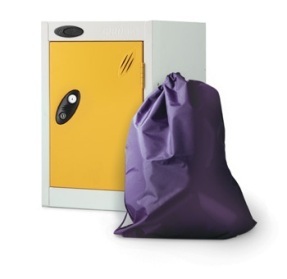 Active coat, present ensures a healthy hygienic locker, keeping your belongings safe and bacteria free and the anti-rust powder gives a long life to the lockers. Shelving and storage ideas may be available at various settings but when it is to be utilized for an office space, finding cost-efficient and resourceful ideas to keep the workplace clean and for storing all the commodities securely all at once becomes a great task. The above-mentioned ideas are the chosen one from certain categories. A whole lot of options are available concerning in the number of compartments, the number of doors, the color variants and so on for both shelving and storage products. Choose from these wide-ranging options to perfectly match the ideas with the office surroundings. What are you waiting for? Invest in the storage and shelving solutions to make work much effortless. This entry was posted on Friday, August 24th, 2018 at 9:20 am	and is filed under Shelving. You can follow any comments to this entry through the RSS 2.0 feed. You can leave a comment, or trackback from your own site.